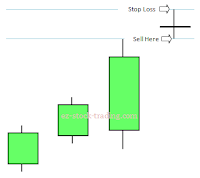 Candlestick pattern always plays a major role to find short or long term scenario of the Equity, Commodity or Forex market. In this article you can learn and see the major Bearish Candlestick Reversal Patterns that encountered after a up trend. encountered after a bullish trend is a reversal signal. 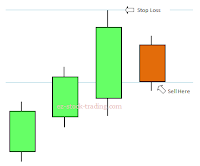 Dark Cloud Cover pattern consists of two days candlestick to formed. 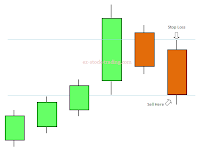 After a long green candlestick formed on the first day the red candle should open above the close of the first day's green candle and also close below the midpoint of the first day's green candle. 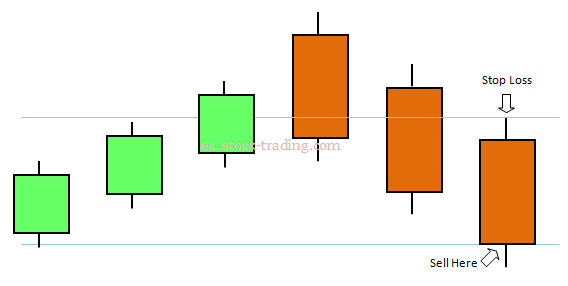 trend will change.This pattern is formed by a green candlestick on the first day, Then we see Doji on the second day that gaps up and close near to it's opening level. 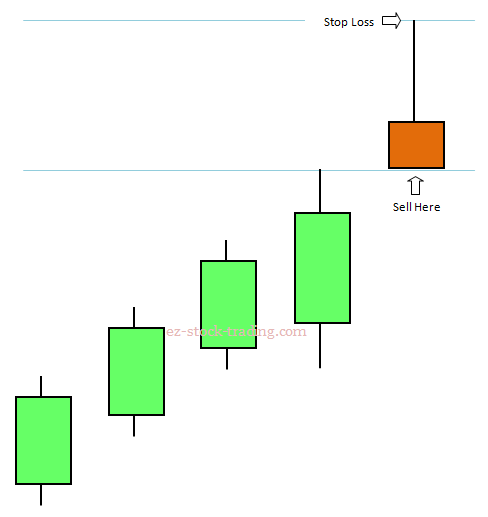 Traders requires wait for confirmation from the next candlestick. If close below the bottom half of the body of the first candlestick one can go for short. The bearishness of the pattern formed on the first two candles is confirmed with the third day's red candle. This pattern is more reliable and most often found on peak of the rallies. 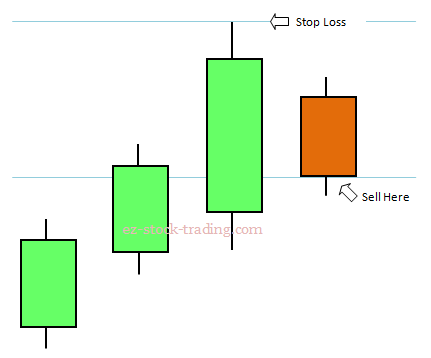 Evening Doji Star exactly opposite to Morning Doji Star candlestick pattern.One can go short sell on the unerlying stock and stop loss can be placed above the high of second day's. pattern and indicates a reversal signal at the end of an uptrend. 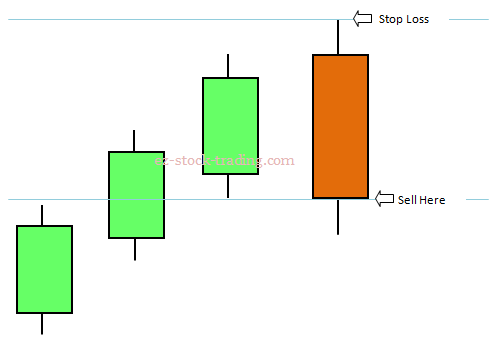 Pattern consists a green candlestick followed by a short candlestick on the 2nd day gaps higher but trade in small range. The bearishness is confirmed by the lower close of the third day's red candle. 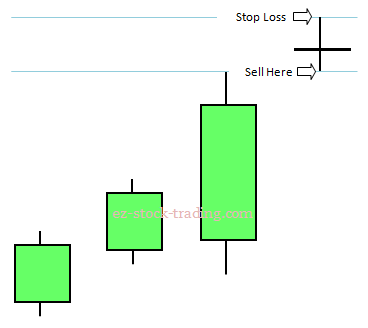 Engulfing Pattern is a reliable reversal pattern. This pattern is formed by a large red body engulfing a smaller green body of the first day, which appears during an bullish trend. On day one a small bullish candle is formed and on the second day a large bearish candlestick is formed which completely engulfs the green body of the preceding day. One can initiate short sell below the confirmation level is defined as the last close and the last high as stop loss for the trade. A Harami pattern gives a signal of loss of current bullish momentum and warn for reversal after bullish trend. Harami means "pregnant" which is a Japanese word. If this pattern formed on the chart it will look like a pregnant woman. Bearish Harami pattern consists two candlestick, A long green body observed on the first day with high volume that continues the prior up trend, On the second day trades in a small range within the previous day's real body and with low volume as compared to previous day and. 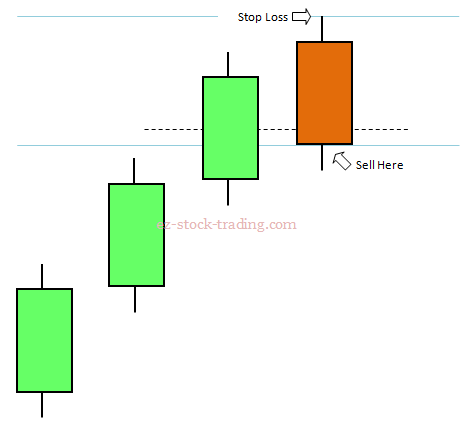 Bearish Harami Cross is a major bearish reversal pattern it's consists two candlestick to formed the pattern. A long green body observed on the first day that continues the prior up trend, On the second day trades in a small range and formed Doji pattern within the previous day's real body. This pattern is even more significant than a regular Bearish Harami. Hanging Man pattern characterized by a hammer that occurs after an bullish up trend is called "Hanging Man" and is a bearish signal. 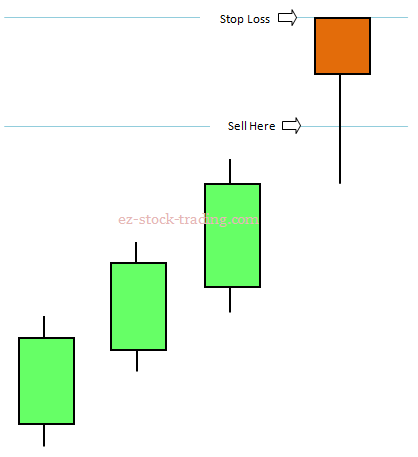 A single candlestick pattern that shows the long lower wick and a small real body at the upper end of the candlestick. Shooting Star is an Inverted Hammer pattern that is characterized by a green candlestick followed by an Inverted Hammer with long upper wick and small real body at the lower end of candlestick. The bearishness confirmed as the low of the candlestick and the stop loss level can placed at the last high. 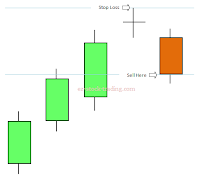 The pattern involves three normal long bearish candlestick that indicates a strong reversal in the market after the up trend. 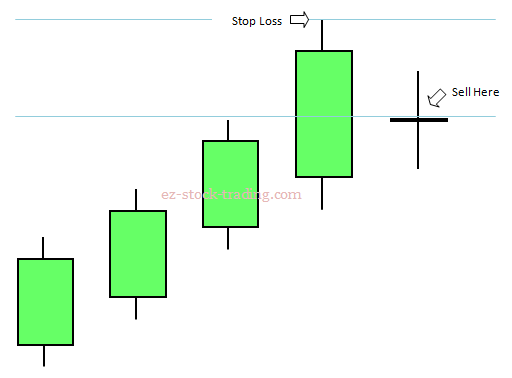 The last two candlestick must close below the close level of preceding candlestick after the higher opening. As mentioned in the name this pattern consists three candlestick, The first two candle is look like a Harami Pattern. The bearishness of the Harami Pattern created with 1st two candle is confirmed on the 3rd day by this pattern. So we can see that Three Inside Down is a confirmed Bearish Harami pattern. This is one more pattern that show confirmation of bearishness in the market. 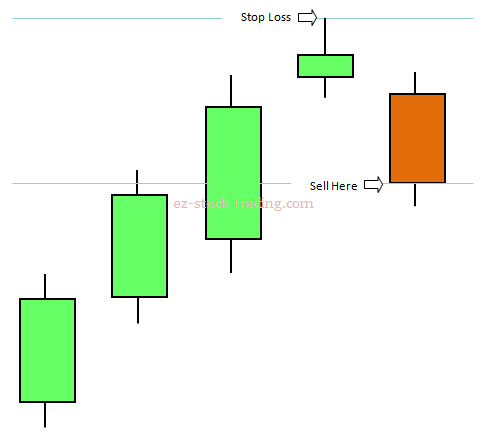 Pattern formed with three candlestick, first green and then with two red candlestick. The bearishness of the Bearish Engulfing Pattern created with 1st two candle is confirmed on the 3rd day by this pattern. So we can see that Three Outside Down is a confirmed Bearish Engulfing pattern. 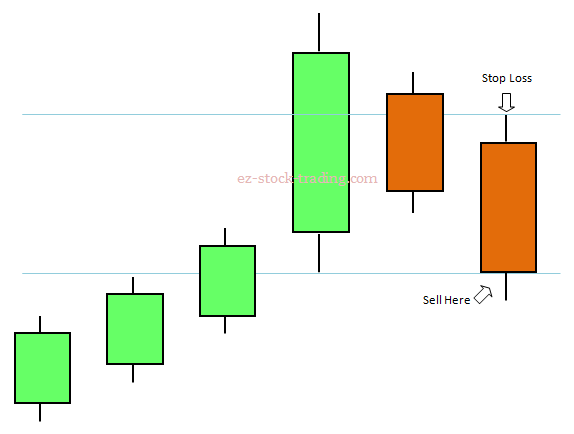 Candlestick graph with Green and Red color combination that represents Bullish and Bearish respectively. 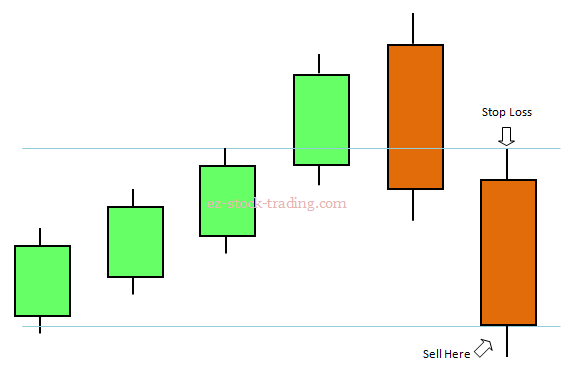 Can you please provide the bullish candlestick reversal pattern in the same way. We will try to publish soon the same. keep visiting !